What’s a surefire sign that a web service has hit the big time? Well, when the celebrities start to pile on of course! The guys behind GiantThinkwell and the Mixnmatch game have teamed up with the Grammy award winning producer, emcee and lover of the natural female form Sir Mix-Alot for a rare Turntable.fm performance celebrating the game’s launch. 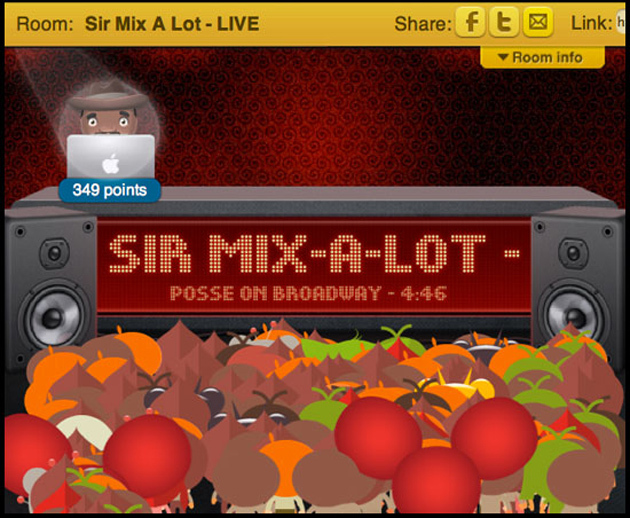 Users who want to join the Mix-A-Lot room and see the Mix-A-Lot avatar can 1) Visit www.giantthinkwell.com 2) Drag the Turntable/Mixalot bookmarklet to their toolbar 3) Click on the bookmarklet to enter the room 4) Click on the bookmarklet again to see the custom icon. Mix-A-Lot will be performing between 2:30 and 5:00pm PST. Still in beta, Turntable.fm Twitter mentions continue to soar, clocking in 13K tweets last week.